Looking for Apple Facts in 2019? Scroll down this page and follow the links. And if you bring home some fruit or vegetables and want to can, freeze, make jam, salsa or pickles, see this page for simple, reliable, illustrated canning, freezing or preserving directions. There are plenty of other related resources, click on the resources dropdown above. More Apple Facts and Fun! A bushel of apples typically weighs between 42 and 48 lbs. United States consumers ate an average of 45.2 pounds of fresh apples and processed apple products. That's a lot of applesauce! 61 percent of United States apples are eaten as fresh fruit. 39 percent of apples are processed into apple products; 21 percent of this is for juice and cider. The top apple producing states are Washington, New York, Michigan, California, Pennsylvania and Virginia, which produced over 83 percent of the nation's 2001-crop apple supply. In 2001 there were 8,000 apple growers with orchards covering 430,200 acres. (don't know how many of those are PYO). Apple trees take four to five years to produce their first fruit, but you normally buy 2 or 3 year plants at the nursery, so it's only 2 years till they produce! Did you know you can carve an apple to make a doll? Weird, but true and they look neat! See this website for how to make one yourself! In Europe, France, Italy and Germany are the leading apple producing countries. Apples harvested from an average tree can fill 20 bushel boxes that weigh 42 pounds each. In colonial time apples were called winter banana or melt-in-the-mouth. China is the leading producer of apples with over 1.2 billion bushels grown in 2001. The U.S. is number 2 and then Turkey, Poland and Italy. 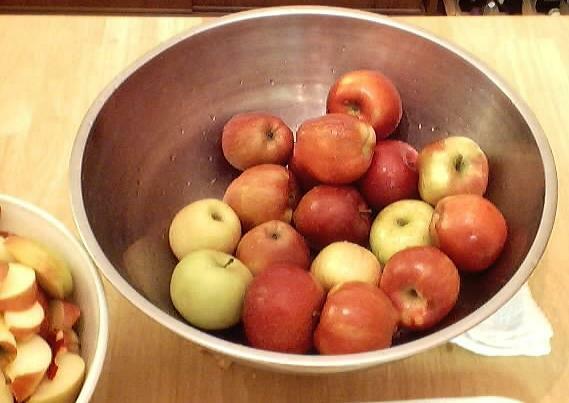 A bushel of apples weights about 42 pounds (up to 48 lbs) and will yield 12 to 15 quarts of applesauce. It's all about the variety! About 100 different varieties of apples are grown commercially in the United States. You really need to choose the type of apple that is best suited for your purpose. Apples can be suited for eating fresh, cooking, baking, applesauce, storing, etc. I have a fairly extensive guide to apple varieties here! Nutrition and miscellaneous facts: One-half cup of apples is only 42 calories. Apples contain no cholesterol or fat and are also low in calories. T Apples are high in dietary fiber, Vitamin A and niacin. They contain iron and other trace minerals and are a fair source of Vitamin C.
Apples are ranked No. 1 in antioxidant activity compared with 40 other commercially available fruits and vegetables. That means a serving of apples has more of the antioxidant power you need to fight aging, cancer and heart disease. The U.S. Apple Association's estimate of the size of the 2014 United States apple crop is 263.8 million bushels. The USDA's August 12th estimate was for 259.2 million bushels. See this page for much more detailed information about the apple crop and apple production trends.